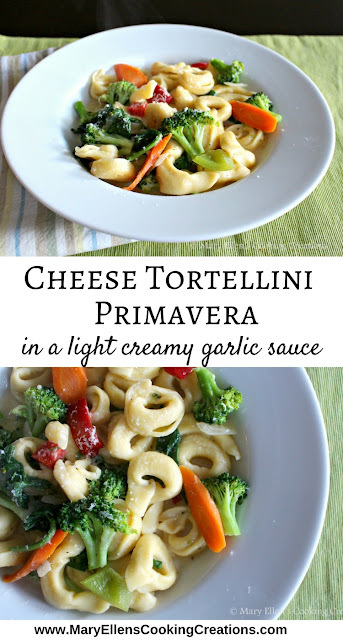 Cheese Tortellini with Fresh Vegetables in a Light Garlic Cream Sauce - A quick and easy meal that comes together in 20 minutes! Yes, you read that correctly. 20 minutes! 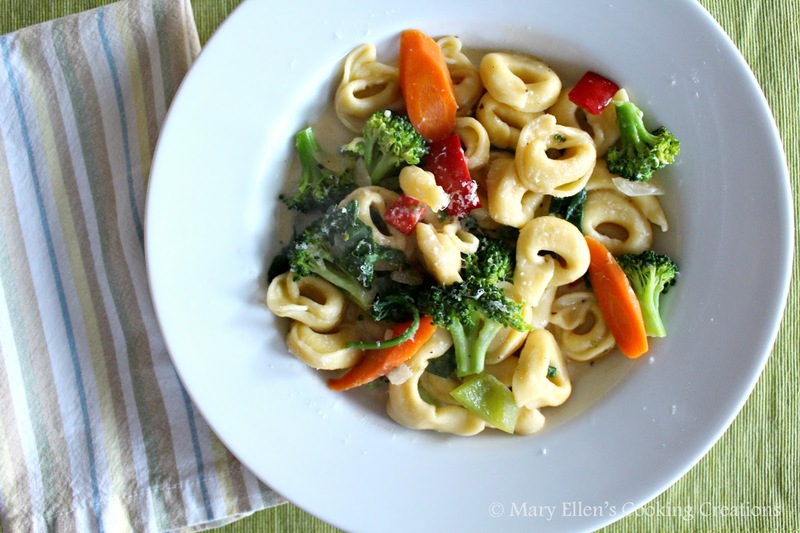 Tortellini is a great pasta to use when you need to cut down on cooking time. 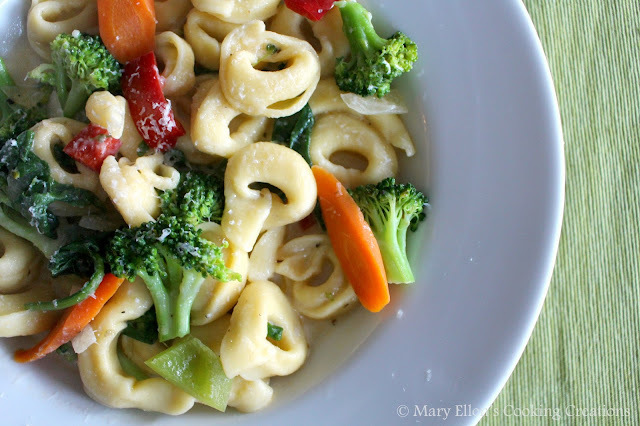 Where other pasta shapes can take 8-12 minutes to cook, you will have perfect tortellini in about 5 minutes. As far as timing, chop your veggies and get out your other ingredients while the water is coming to a boil. Once the water boils, toss your veggies in for one minute. Blanching the veggies will cut down on your sauteeing time. Then, you make the sauce when you drop the tortellini. The sauce and tortellini will be done at the same time, and then all you need to do is toss it all together. This is a great Meatless Monday meal, a perfect quick weeknight dinner, and makes great leftovers (if you have any!) for lunch the next day. - Bring a pot of salted water to a boil. Once it is at a full boil, toss in the broccoli and carrots. Cook for one minute and then remove with a slotted spoon into a colander and run under cold water. Drain well. Return the water to a boil and put in the tortellini.Cook for approximately 5 minutes, or until the tortellini pops to the top of the water. - Heat olive oil in a large saute pan. - Toss in the onions and garlic; saute 1 min. 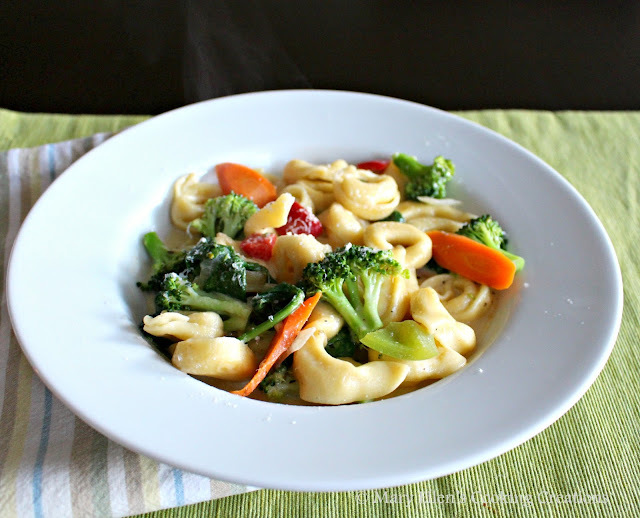 - Add the broccoli, carrots, red and green pepper, salt, pepper and Italian seasoning; saute 1 min. - Add the white wine, stir for 20 seconds before adding the broth. Bring to a gentle simmer and then add the cream and Parmesan cheese. - Drain the tortellini and add to the veggie/sauce mixture. Toss and serve.